Prospect List Building Tools Review is back. This time, we checked out LeadIQ – a prospecting tool created in San Francisco. I interviewed Cole Fox, their Chief Sales Hacker, and found out how to build extended, up-to-date lists of prospects including more than just names and emails. Meet Cole and discover another smart plugin for outbound prospect list building. LeadIQ is a venture-backed sales enablement startup, based in San Francisco Bay Area. It was founded in 2015 by Mei Siauw and Angelo Huang. They have grown quickly with over 10,000 users and 300 paying customers. I had a pleasure to interview Cole Fox, who is LeadIQ’s Chief Sales Hacker with 6 years of experience selling enterprise software. As an early employee on LinkedIn’s sales team pre-IPO, Cole quickly noticed the need for start-ups to scale their sales and has worked with many over the years. I asked Cole my standard set of questions about the prospecting solution he and his team have been working on. How would you describe LeadIQ in 4-5 sentences? Cole: LeadIQ is the fastest way for sales teams and recruiters to build lists of verified contact data from the web and sync it into a spreadsheet or even Salesforce. What’s important, the data we give you is always up to date. We’re not a database of stale information. When you prospect with LeadIQ, we find the data in real time by scouring the web for intel. What is the greatest benefit of using LeadIQ? C: Your time spent entering prospect data will be a near-zero. Prospecting will be more fun! LeadIQ technology automates the most time-consuming and inefficient part of sales jobs and improves their productivity by 3-5x. How does the process of building database look with LeadIQ? Download LeadIQ Chrome extension for free. Go on LinkedIn or AngelList and do a search. Simply capture your prospect(s) to a list with the click of a button. The list will show up on your account. You can also sync the list as leads or contacts to Salesforce, Google Sheets, or export as a CSV. Do I need any additional tools/add-ons to use LeadIQ efficiently? C: You don’t need a LinkedIn premium but it can certainly help with search filters, more access outside your network, etc. Many of our customers use LinkedIn Sales Navigator, since it shows more results per page; they can build lists even faster. Again, not a requirement though. What kind of information can I actually collect using LeadIQ? How many contacts can I have per month? C: We range from 150 verified contacts a month, all the way up to tens of thousands for large sales teams. C: The pricing starts at $50 USD for an individual user, month-to-month for 150 verified lead capture credits. We can also do team and bulk lead purchase plans with discounted rates. You can contact us for details. Is there a free trial? C: Yes, you’ll get 50 verified lead credits to use and Salesforce sync for two weeks – free. We really appreciate that LeadIQ values the quality of contacts they’re providing. In the plugin, you will see a little orange warning sign, if a contact’s profile lacks some information (for instance, lack of current company info). You can’t even add such a contact to your list. That’s great, because you know at the time of the research if the contact is worth collecting or not. As a result, you don’t waste your time researching prospects that you won’t be able to contact in the end. The efficiency is stunning. Basically, if the plugin allows you to add a prospect to your list, you can be almost sure their email and other contact data will be provided in the LeadIQ panel. That is absolutely amazing because many prospecting tools provide valid contact details for only 40%-50% of the prospects you collect. So you may research 100 prospects, and get only 40 confirmed email addresses. With LeadIQ, if you add 100 prospects to your list, you actually get 100 emails. That’s definitely a huge advantage. And the best part is, you don’t get just the emails. You get a wide range of information about your prospects. That allows you to segment your list and create email campaigns that are properly customized. The list on the screen shot below is just a part of what you get. When you’re in the panel, you can side-scroll the table and you’ll see all the fields Cole has listed in the interview above. Good news for all Salesforce users: LeadIQ provides a native integration with your CRM. That means you can conveniently push your contacts directly from LeadIQ to Salesforce, which virtually saves hours of your precious time. Plus, you can test out the integration during your free trial period. LeadIQ offers the ability to collect contacts while researching prospects on LinkedIn and Angel List. Whereas the plugin works great with LinkedIn, it’s not so amazing with the Angel. Don’t get me wrong, you can still capture contacts from Angel. It’s just that on LinkedIn you can grab contact details from a whole list of filtered profiles. So you see 10 people at a page, and you don’t need to go to their profiles one by one to capture their data. But that’s not possible at Angel. You need to go to your prospect’s profile to capture their contact data. That’s more time-consuming, obviously. On the other hand, it requires you to research your prospects more thoroughly, which allows better qualification. LeadIQ works a little bit different than the plugins we’ve tested so far. Basically, it opens in a kind of a separate tab of your browser. That means you see one tab with LinkedIn open, and a narrow tab with the contacts “copied” from your current LinkedIn search. I’m sure there’s a technical reason for that, but as a user, I’d prefer to have all of this in one tab. In a perfect scenario, I would like to go to LinkedIn, do my search, and after turning on the plugin see some buttons next to the prospects on the list. As I already mentioned, LeadIQ works great with LinkedIn, and it allows you to capture prospects from individual profiles on Angel List. It would be great if the plugin allowed its users to collect contacts while prospecting on Twitter, CrunchBase, and other platforms as well. I don’t see it as a drawback, though. From my point of view it’s better to start from just one platform, but make the tool working really great with it. And this is exactly what LeadIQ have done so far. I only hope that expanding to other platforms is on their agenda for further development. 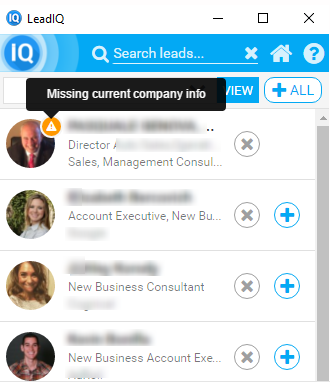 LeadIQ works great if you’re prospecting on LinkedIn. It will also allow you to grab contacts from Angel List. It allows you to capture more than just email address. You can build quite extended lists of prospects using the tool. It provides very accurate data. You are not able to add a prospect whose data hasn’t been verified. If you capture 100 prospects, you will get 100 email addresses. The price per contact is not the lowest, but if you consider the effectiveness of the tool in finding the accurate data, it’s totally worth it. The app allows a direct integration with Salesforce. There is a free trial. You can get 50 verified lead credits and Salesforce sync for 2 weeks. This is a young product developed by a team of experienced professionals. They’re really focused on the quality of their solution, which is a great plus. Additionally, they are very responsive and the contact with them has been a real pleasure. Hope this review will be a trigger for you to give LeadIQ a try. It’s undoubtedly worth it. Used to spend lots of time contacting prospects, especially via email. One of few people on Earth who read crappy cold emails from start to end and analyze them – for purely educational purposes. Taking care of this blog, reporting Woodpecker’s journey on the pursuit of happy openings, successful closures and all the new skills we acquire in between. Previous postWhat Outbound Sales Metrics Should We Track and Why? Download free PDF checklist & make your emails GDPR compliant step by step. Get weekly email outreach tips. Go through this list of 42 quick questions to make your cold email message work. Get weekly email outreach tips. Thinking about intreviewing your customers yourself? Get our list of questions for some inspiration.